As none of O’Keeffe’s paintings are currently held within UK public collections, this is a rare chance to see such a broad variety of the artist’s work. Moreover, this will be the first exhibition of O’Keeffe’s works in the UK in over 20 years. Marking the 100th anniversary of Georgia O’Keeffe’s New York debut, this retrospective presents over 100 of the artist’s works. Spanning six decades of her career, the exhibition charts the developments in O’Keeffe’s practice, from her earliest abstractions through to her late paintings, and explores the recurring themes within her work. The show includes the much celebrated flower painting, Jimson Weed/White Flower No. 1 (1932). 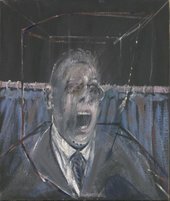 Sold at Sotheby’s in 2014 for $44.4 million, the work holds the record for the most expensive painting by a female artist sold at auction. 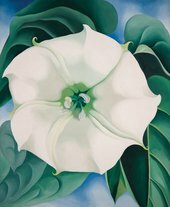 Although Georgia O’Keeffe is most famous for her flower paintings, these make up only a fraction of her overall works. The exhibition is an opportunity to explore O’Keeffe’s various sources of inspiration and wide range of subject matter. I hate flowers - I paint them because they’re cheaper than models and they don’t move. A recurrent concern within O’Keeffe’s work is the study of nature; drawing from landscapes, leaves, rocks, shells and bones. 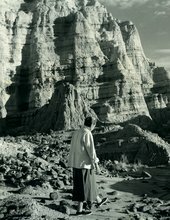 In 1929, O’Keeffe made the first of many trips to northern New Mexico. Over the next twenty years she made almost annual trips to the area, relocating for up to six months at a time where she would camp out in harsh weather conditions and immerse herself in the landscape. This Southwestern environment had a lasting impact on O’Keeffe’s paintings, inspiring multiple depictions of sun-bleached animal bones, stark, rugged landscapes and high desert terrains. In 1916 O’Keeffe participated in a group exhibition at ‘291’ gallery, marking her official debut as an artist in New York. She later became part of the ‘Stieglitz circle’, which included early modernists such as Marsden Hartley, John Marin, Paul Strand and Edward Steichen. The abstract charcoal drawings and watercolours on display reveal the early stages of O’Keeffe’s artistic career and her interest in artists including Arthur Wesley Dow and Wassily Kandinsky. By the mid-1920s O’Keeffe was widely recognised as a founding figure of American modernism and became the first female painter to gain such acclaim alongside her male contemporaries. In 1946, she became the first woman to earn a retrospective at New York’s Museum of Modern Art. Creating innovative artworks, including her distinct flowers, dramatic cityscapes and bold desert-scapes, O’Keeffe’s paintings have become synonymous with the movement, blazing a new trail for later generations. In 1924 O’Keeffe married the photographer and gallerist Alfred Stieglitz (1864-1946), the man behind her first exhibition and many subsequent ones. When the pair met he was well-established; she was unknown and 24 years his junior. Their marriage was an enduring one, they wrote over 25,000 pages of letters to each other. I like being first – if I’m noticed at all – that’s why I get on with Stieglitz – with him I feel first – and when he is around – and there are others – he is the centre and I don’t count at all. Stieglitz and O’Keeffe’s relationship greatly impacted their careers and resulted in a mutual exchange of artistic influence. The exhibition includes a series of Stieglitz’s portraits and nudes of O’Keeffe, cityscapes that parallel her own and examples of his series of cloud studies called Equivalents, as well as works by key members of the avant-garde circle around Stieglitz. Not only do these works reveal the couple’s creative partnership, but they also reveal O’Keeffe simultaneously as a muse and a collaborator in Stieglitz’s work. O’Keeffe paid close attention to photography from her first introduction to Alfred Stieglitz and later meeting with members of his circle, such as Paul Strand, in 1917. She understood its importance as an art form equal to or sometimes surpassing painting – a radical view at the time. I am at present prejudiced in favour of photography…I feel that some of the photography being done in America today is more living, more vital, than the painting and I know that there are painters who agree with me. 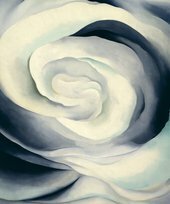 The impact of modernist photography can be seen within O’Keeffe’s representations of flowers. For example, in Jimson Weed/White Flower No. 1 (1932), parallels can be drawn between modernist photography and the artist’s use of magnification and cropping. 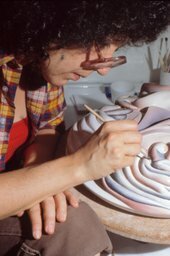 O’Keeffe uses such techniques to explore her interest in abstracting the natural form. During her later career, O’Keeffe sought to capture what she described as ‘the wideness and wonder of the world as I live in it’ (Georgia O’Keeffe in Charles Eldredge, Georgia O’Keeffe: American and Modern, 1993). This led her to explore the landscape of the United States, in particular the Southwest. She often travelled with photographer and close friend Ansel Adams, who became well-known for his images of the American landscape, examples of which are also included in the exhibition. Georgia O’Keeffe runs 6 July – 30 October 2016 at Tate Modern. Book tickets here.